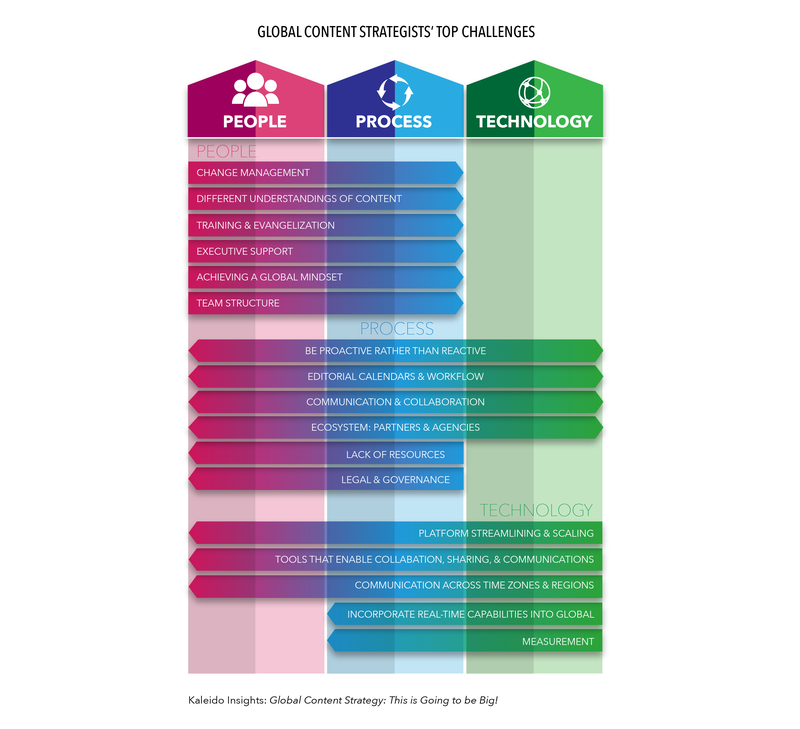 Today my company Kaleido Insights publishes this new research on global content strategy that outlines the challenges organizations face trying to scale and at the same time, coordinate content initiatives beyond borders. The report also looks at global content strategy best practices across people, processes, and technology. For now, let’s focus on the primary challenges facing global content operations. It’s not that large global enterprises lack content strategy. Nearly all the enterprises we formally interviewed with for this report have a content strategy in place. Instead, the challenge is implementation; it can be a battle for hearts and minds as well as for budget and executive buy-in. “Strategy is a piece of paper,” laments one senior executive. as social media, but not others, such as the company website. Adoption by business units is another near- universal problem. One large global brand, for example, has differing formal strategies in various global regions; the company’s challenge is cohesively tying these together. Conversely, one global enterprise has a top-down global strategy that can be tone deaf when it comes to regional adoption. Leaders select global marketing and branding elements with little regards for how images or ideas might translate across cultures and borders. Case in Point: Naming conventions and regional semantics matter. An enterprise’s US headquarters acquired rights to NFL brand assets for a global marketing campaign, oblivious to the fact that “football” means something very different in the USA than it does in every other country on the planet. When creative assets were sent to foreign offices, marketing staff were flummoxed, not to mention bereft of content assets. Proximity impacts a country or region’s content needs. “Global” content doesn’t always fulfill what a locality requires, nor is it as relevant as local news, events or cultural issues that are geographically closer. • Channel strategy, as the ecosystem broadens and audience/algorithms are ever-changing. • Customer experience, particularly as related to emerging technologies and related changes in consumer behaviors. • The ability to implement the voice of the customer at the core of content strategy initiatives. All these challenges are just the tip of the iceberg. The accompanying chart illustrates more specific hurdles related to people, processes and technology. This are much more deeply discussed in the research, which also addresses the very real ways organizations such as Visa, 3M, Bosch, Save the Children, Cisco and IBM are addressing them. Please read the report and let me know what you think. Global Content Strategy: It’s Gonna Be Big!